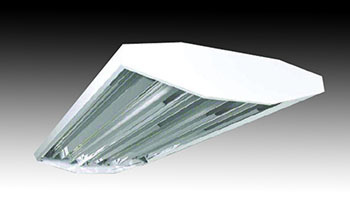 • All-new high efficiency, heavy duty T8 or T5 High Output fixtures for high-bay warehouses, manufacturing plants, sports facilities and retail spaces. • New Engineered Lighting design features precision-formed specular or white aluminum reflector to achieve maximum light output. • Replaces H.I.D. fixtures on a one-for-one basis. For example, T5 4-lamp model delivers more than 19.000 lumens from four economical 54-watt H.O. lamps. See attachments for photometric data for other models. • Surface, pendant, chain or stem mount. • Optional wireguard with innovative fastener design allows easy lamp access. • Highest quality materials and workmanship. Union made in the U.S.A.